This year it was like I suddenly woke up and everyone had money saved easily for Christmas but me. Oh, I saved money buying Christmas don't get me wrong. I faithfully searched the ads, got the best deal, and then made sure to put my purchases on my credit card that earned money back (we always pay it off every month). I also made sure when I bought a gift card that it earned rewards for fuel or something. Don't get me wrong I earned some of my gift cards or got a discount on them but it was all a scramble at the last minute. None of that's wrong in fact it's great but I want to earn my gift cards and gift a few toys without spending any money...like my daughter! The first I got wind of my daughter's amazing savings is when she told me ahead of time to not worry about buying my birthday dinner for the family. You see, every year we invite our close family to go out to dinner with us on our birthdays and we pay the bill. It's a fun time but it can get expensive with 6 people to pay for. If our family was bigger they would get a home cooked meal ha ha. Well anyway, her gift to me for my birthday would be an IHOP gift card for $50.00. I said what? Then immediately said,"that's too big of a gift!" She sighed (she does this a lot with me) and she knew that she had to fess up. She knew that I wouldn't stop till I knew why or how I got such a great gift. She's right. So she said, "Don't worry Mom, It was all for free with my Swagbucks I earned." Ok, NOW I am jealous! Then, she proceeded to tell me that she got part of her Dad's birthday gift for free and some toys that were a great deal for Free with an Amazon gift card. Over $125.00 worth of free!! I can't stand her (not really). If you haven't signed up for Swagbucks yet and really don't know what I'm talking about here is some basic information. Swagbucks is like any other search engine. You sign up then down load their search bar then you can start to earn Swagbucks by searching for things on the internet like you normally do (not every search earns swagbucks). You know search for things like, How much money for a plane ticket to sunny Florida or something like that. You can then redeem your Swagbucks for gift cards and other great prizes. Searching is not the only way to earn Swagbucks. 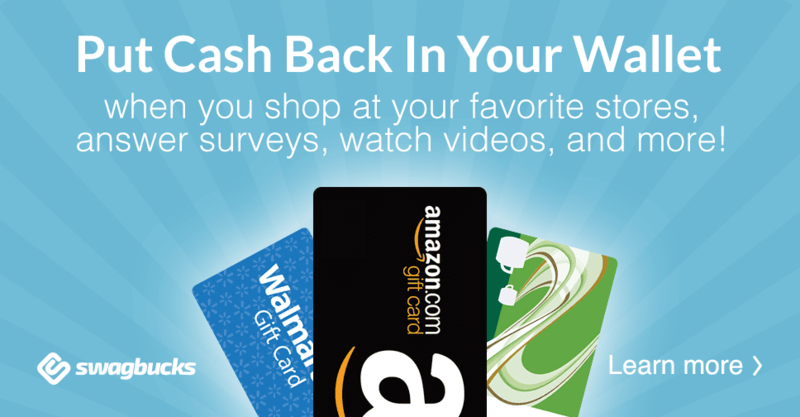 Here are some popular ways: take surveys, get Swagbucks when you shop at popular companies on the internet, answer the daily poll, play games, referrals, watch videos... The list just goes on and on. My daughter doesn't have a whole lot of free time. So how did she manage to earn all her Swagbucks? Referrals! She has one or two of her people that she referred when she had a blog that takes Swagbucks seriously and they earn many Swagbucks for her. For every referral you get 10% of their earnings for life! That means if your friend earns 500 SB you get 50 SB. Update: there are exclusions to how many points you earn from your referrals. From their website: Categories that do not count towards 10%: Sign-up bonus, Swag Codes, Daily Goal Bonuses; others may be added. You can refer them by email or copy and paste the referral link to share anywhere. You don't have to have a blog to share it. Now, don't get me wrong, I do Swagbucks but I tend to spend them right away. My daughter saves hers till Christmas and then she has this bounty of Swagbucks that she can redeem. So, this year I'm going to get serious about Swagbucks. I'm going to try and earn more from this day forward and save them all till Christmas time. I want to be just like my daughter! 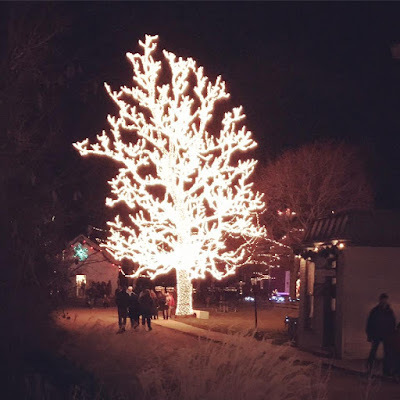 How We Are Saving for Next Year's Christmas (Win it) -Part 3!